Just a few of the photographers on the trip. 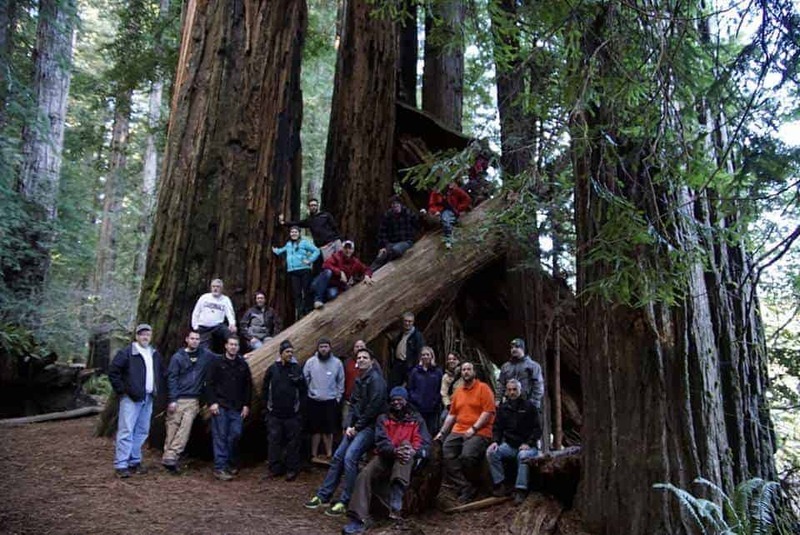 We never got a group photo with some of those who didn't make it down to the Redwoods. 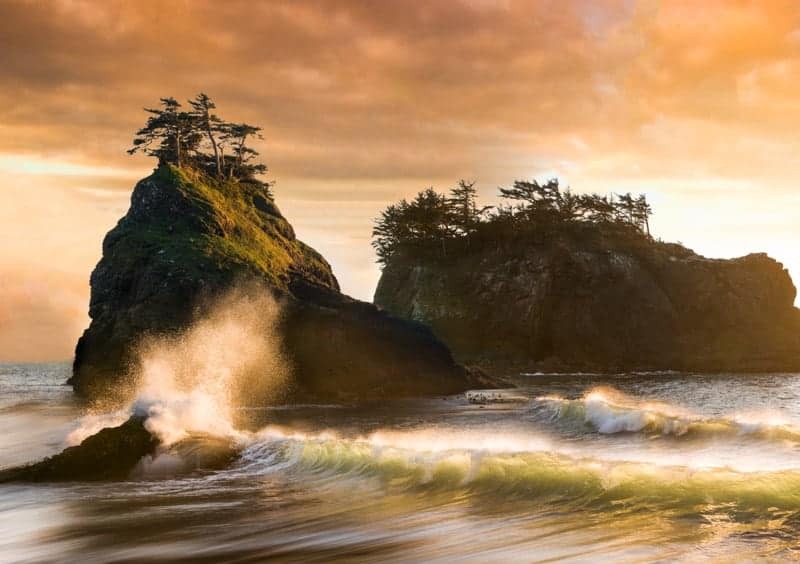 Last week I had the pleasure of holding a completely free photography workshop with 55 readers of ImprovePhotography.com in Oregon. On this page I want to share a play-by-play of some of my photos from the trip, but if you're looking for full tutorials on how each one of the photos is made, complete with “before Photoshop” photos, camera settings, and techniques, sign up for my Tuesday “Behind the Photos” newsletter, which has been hiatus for a couple weeks but will be back on Tuesday! 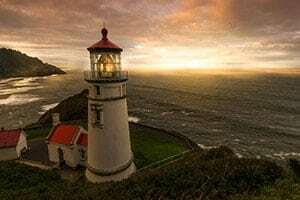 This first photo was taken at the gorgeous Heceta Head Lighthouse in Florence, Oregon. I photographed the lighthouse the night before, but couldn't capture anything I was happy with. The next morning we woke up to shoot Thor's Well, but I struck out again due to the low tide. So, we raced back to the lighthouse to see if we could capture it in sunrise lighting. We pulled up to the Lighthouse just as the sunrise was fading away, and it was a 1/4 to 1/2 mile hike up a hill to the location. I ran so fast I nearly coughed up a lung! I got to the top of the hill just as the last morning light was fading, and the sun was rising at my back (not in the photo). Fortunately, with a little Lightroom work (that's right–Lightroom with very little Photoshop), I drew in a sunrise that I think looks pretty convincing. I think this was my favorite shot from the trip. One of the coolest parts of doing photography at one of our free photography workshops, is that with so many photographers gathered together in one place, you find unbelievable locations! 55 people searching around a small town for photo location results in some amazing finds. I had completely missed this fantastic rotting boat, the Mary D. Hume, in the bay only 5 minutes away from our hotel. Fortunately, some of the other photographers spotted it and shared the spot with me. 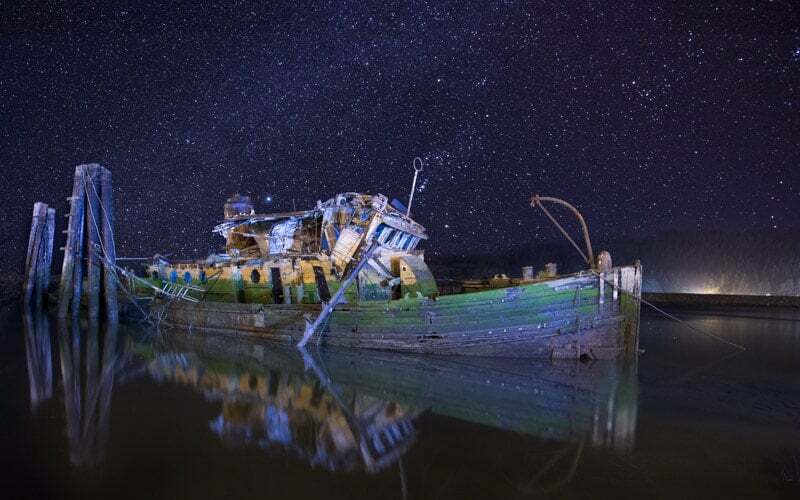 We spent a few hours one night light painting the boat. Lesson learned: get off the boat and stop light painting before the tide rises (thanks for the sacrifice, Mark!). This lighthouse is unbelievable. It was quite an adventure shooting this one. 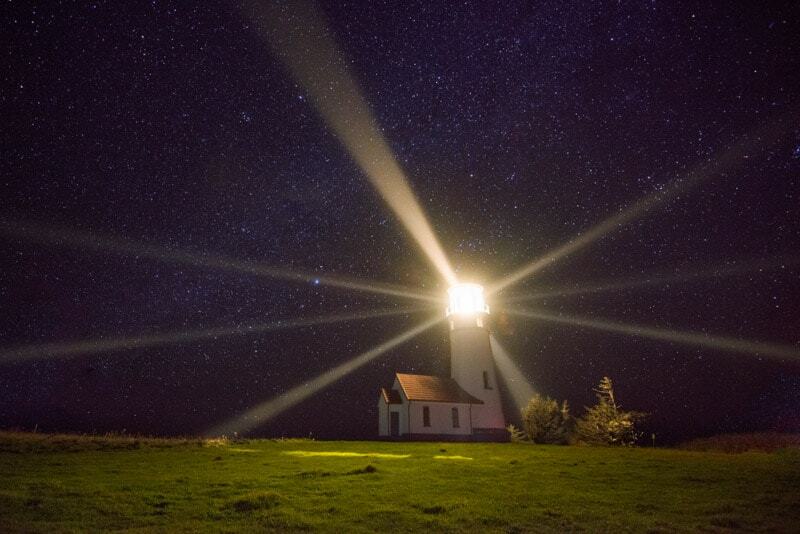 No Photoshop tricks to get the light rays, which are caused by the six-sided lens on the lighthouse. This photo was taken at Secret Beach. I was watching the sun set in this gorgeous location, but I felt a bit frantic inside because I just couldn't find a composition that I was totally happy with. I wandered all around the beach for an hour and then decided that the sea stacks just weren't in the places I wanted. So, I took photos of two different sea stacks, a wave, a photo of a wave crashing on a rock, and took the sunrise from a few days ago, and put all of the pictures together in one. The photo above is the result, which I was pretty happy with. 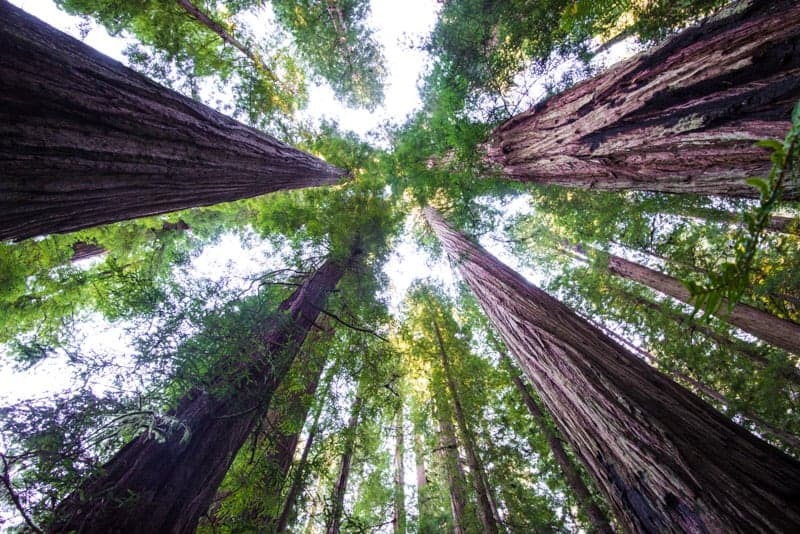 On the last morning of the workshop, we took the 40-minute drive down to the Redwoods in California. It was another beautiful location. I wouldn't say my photo was anything special, but it was a fun spot to see. Be sure to sign up for the “Behind the Photos” newsletter to get the full tutorial on how to create these photos in your email, every Tuesday. It's totally free, and about the only place you'll find a professional photographer sharing the unretouched original photos straight out of the camera so you can see how the magic is done.